The toolkit of architecture education consists of a cardboard box, a teachers’ card and 13 task cards as well as 4 sensory tools (a hand mirror, cardboard cone, eye mask, and fingerless gloves). The sensory exercises and tips for further work are intended as a guideline and source of inspiration for the teacher in classroom work. They can easily be adapted to suit each situation. The tools can be utilised in each of the exercises. They encourage pupils to study different factors of architecture through their own hands, eyes, ears and nose. The intension is to sharpen awareness of each particular sense by blurring the influence of the other senses. The Toolkit has been produced with the help of Nordic Culture Foundation and it is made by the Nordic Playce members. 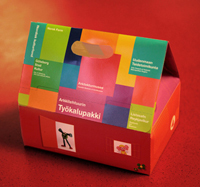 It was published in Finnish language at September 4th 2009 at Helsinki during Architecture Education for Children conference.